“What has your role as a StreetLeader meant to you this year,” I recently asked Ismael. As a StreetLeader, Ismael is a teacher, mentor, and role model for the younger students who attend our afterschool and summer programs. Ismael embodies the vision of our StreetLeader Program—to raise a new generation of leaders from Charlotte, rooted in their Christian faith, who have a vision to restore their communities and our city. After finishing high school, Ismael plans to study medicine in college and go on to medical school. He aspires to become a neurosurgeon and to mentor future StreetLeaders. 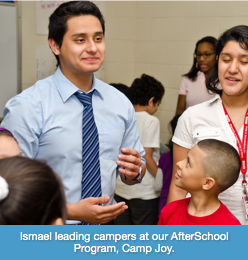 Ismael inspires the children at our afterschool and summer programs on a daily basis. He is fiercely loyal and loves each camper in a way that makes them feel like the most important person in the world. And that’s how the StreetLeader Program works. As Ismael serves an en exemplar StreetLeader, he is a powerful role model for other StreetLeaders and our younger students. Younger StreetLeaders strive to emulate the compassion, faith, and perseverance that define his leadership. Children in our programs watch Ismael and dream of becoming a StreetLeader when they grow older. A community of young leaders is formed, united by the goal of making a difference in their city. Ismael will be the first to tell you, however, that the children in our programs influence the StreetLeaders just as much as StreetLeaders impact them. Before starting with UrbanPromise last fall, Ismael felt alone and doubted his worth. It was the children at UrbanPromise that began to change his opinion of himself, Ismael told me. “The kids value you so much, it makes you realize how much you are really worth,”he explained. Research tells us that jobs can have a significant impact on the lives of adolescents, especially young people who grow up in low-income communities. Positive outcomes include increased school performance and attendance, increased SAT/ACT scores, decreased violence, and decreased involvement in drugs. StreetLeaders like Ismael know the impact of a job at UrbanPromise transcends the numbers. To them, the StreetLeader job represents hope, purpose, community, and the opportunity to make a difference in their city right now. But providing jobs for our StreetLeaders requires a significant financial investment.It costs about $3,500 to employ a teen for the school year; $4,800 for the entire year, including the summer. This breaks down to $25 per day, $100 per week, or $400 per month. I’ve promised Ismael and 21 other teenagers jobs this school year as StreetLeaders. This Christmas, I’m hoping you can help us employ these teens. As Ismael’s story shows, when you choose to support our StreetLeaders, you provide much more than a job. Thank you for your generous prayers and gifts this Christmas and throughout the year. No Comments to "December 2014 Newsletter: Ismael’s Story"